Welcome to support credit unions. Because credit unions are not-for-profit financial institutions, their focus is serving the financial needs of their members and not making a profit. Please check out our new blog! Is a Credit Union Right for Me? People all over the world belong to credit unions, including over 91 million members in the United States. Because credit unions are not-for-profit financial institutions, their focus is serving the financial needs of their members and not making a profit. On the whole, credit unions typically offer higher rates on savings, fewer fees, and lower rates on loans. As not-for-profit depository institutions, credit unions were created to serve members as credit cooperatives. All About Credit Unions Credit Union Resources & Links, History of Credit Unions and also the latest information on the fradulant activities of the banks, financial crimes, forcloseures and much more. 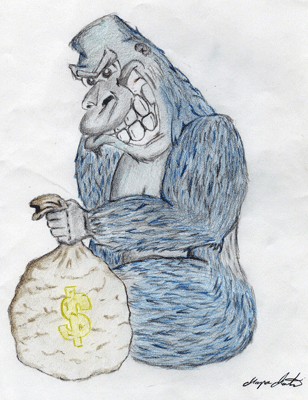 'Kid KoKo' is our gorilla protecting credit unions from the Evil Banksters!!!! A federal credit union is a cooperative financial institution chartered by the federal government and owned by individual members. In the United States, credit unions are not-for-profit organizations that exist to serve their members rather than to maximize corporate profits. Once you select a specific credit union, you can view more details about that credit union, including contact information, branch locations, services offered, and recent financial statements. Anybody can join a credit union. Each credit union serves what’s called their “field of membership” – that’s the commonality between the members. If your group is eligible, NCUA’s staff will assist you with preparing an application for a charter and see that your group receives guidance in getting your federal credit union started. Because credit unions are not-for-profit financial institutions, their focus is serving the financial needs of their members and not making a profit. In general, credit unions offer higher savings rates, meaning that your money grows faster, and lower rates on loans, meaning that you will owe less over the lifetime of the loan. NCUA makes financial information about credit unions available to the public through Financial Performance Reports (FPRs). Credit unions provide valuable access to financial services for people underserved and unserved by traditional financial institutions. Federally-chartered credit unions are regulated by the National Credit Union Administration and insured by the National Credit Union Share Insurance Fund, which is backed by the full faith and credit of the United States government.